I can't be the only one who screams and shouts at TV adverts, can I? There have been a couple of new ones that have annoyed me with their deeply sincere wish to stop me wasting my valuable time. I dye my hair. It takes about 30 minutes for the colour to "take". But now ... *drumroll* ... 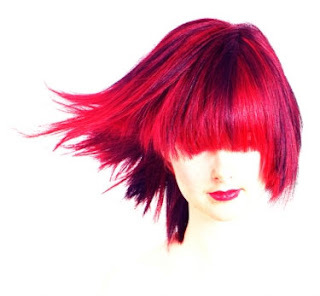 I can dye my hair in TEN minutes and save valuable life time! But that's not the worst of them. I quite often fancy a tuna sandwich for lunch. But the strain, the mental anguish of draining the tin? Can I face it? Will I expend more calories opening and draining the tin than I will benefit from by eating? Worry no more, gentle reader. John West have the answer. "We are single-minded in our focus and understanding of the consumer and have undertaken extensive research to ensure we are meeting their needs. "What was paramount in our learnings was consumers want easier ways to prepare their tuna without the mess and hassle associated with draining. 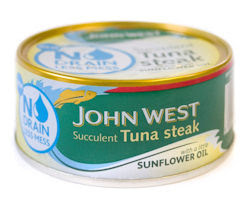 "John West No Drain Tuna meets this demand and offers consumers something new and exciting. But can this particular lowly sandwich-maker take this level of excitement? *argh* Are they mad? In what way is it exciting? I'm off to the supermarket shortly, I expect I'll see hordes of busy consumers mobbing the John West stand, shrieking "At last! The solution to our busy lives! The quest to save time wasted in messy tin draining is over!" and then there's the one with the little boy who tells his mummy he wants to do a poo...but not in his own bathroom. Oh no. He wants to go to his friend next door's bathroom, because it smells nice. Lol! Just imagine how many meerkats could be made in all this saved time! LOL... the visual mind pic of a mob of delerious canned tuna hunters is priceless. I like to think that the 30 minutes it takes to color my hair GIVES me an extra 20 minutes of life-time, since I am free to do what I want (as long as it is protected against drips!). The WORST new product I have seen advertised (couple years back) was also based on "market research". Plus-sized maxi pads for chubby chicks. I am a chubby chick. They are finally addressing my needs! ...errr...that was never one of my needs. My girly bits are the same size as everyone else's. What kind of ridiculous stereotype were they trying to promote? Oh no, don't get me started! I thought the same about the hair dye one. The one I really hate is the Always one that tells me that by wearing their nappies, I can have a 'happy period'!! I'm sorry but nowhere in my vocabulary do those two words go together!! My husband thinks its a hilarious ad...mainly because I then spend the next ten minutes ranting about it. I wish there was no drain tuna in the US! See we are not the world leaders politcians insist we are.